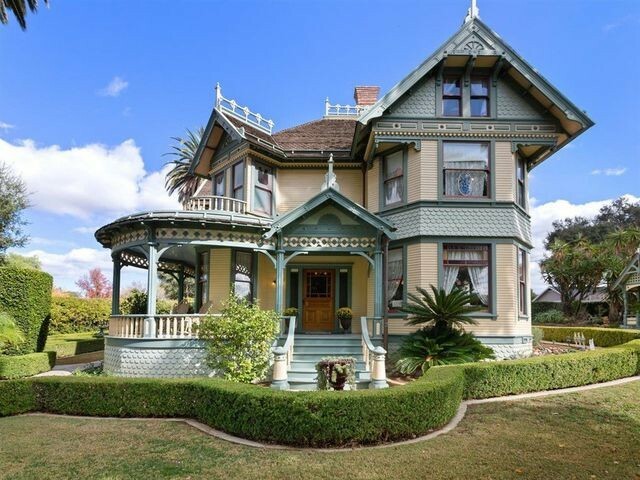 Known as the Beach house, this classic Victorian on the market for $3.3 million in Escondido, CA, is nowhere near the beach. Although this vintage gem is located in San Diego County, you will not hear the sound of waves crashing nearby. This Beach house sits pretty atop a knoll almost 15 miles inland from the Pacific Ocean. Built by Albert H. Beach (hence the home’s name!) 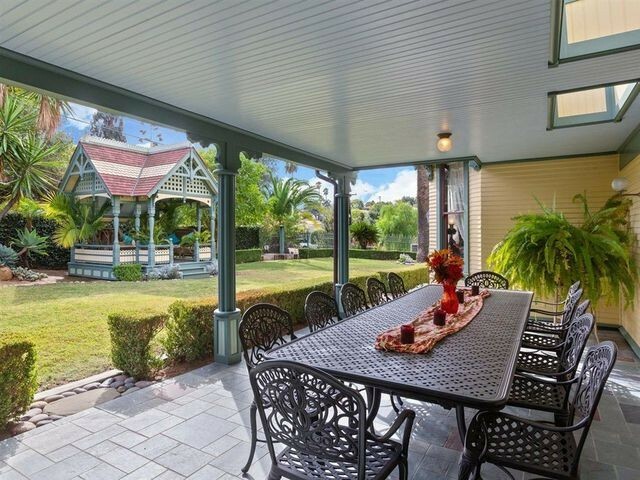 in 1896, the classic home has plenty of charm, but proximity to sand is not one of them. 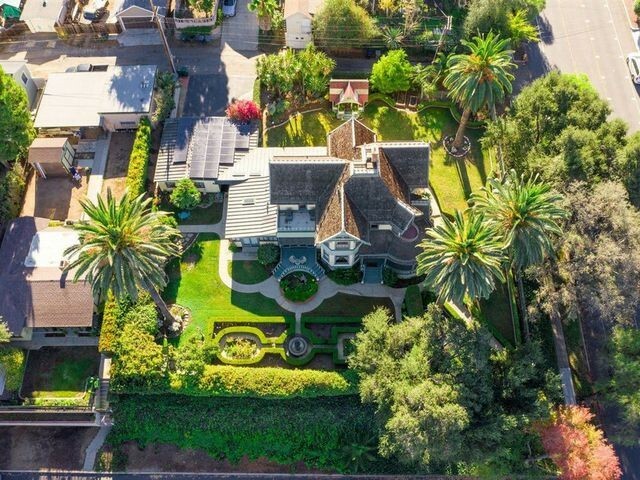 The property’s half-acre grounds are green and expansive and include immaculately manicured hedges and gardens, stately palm trees, intimate conversation and dining areas, terraces, and sparkling water features. 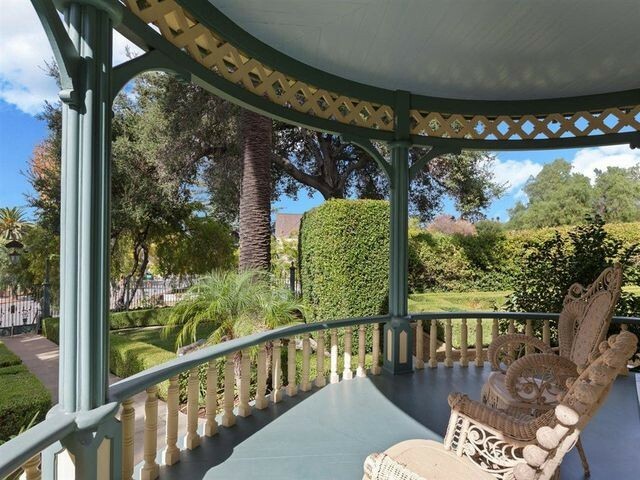 There’s also a period-appropriate, Swiss-Victorian gazebo, assembled in the tongue-and-groove method, with nary a nail. And the lamp that hangs in the gazebo is notable—it once hung in the home of Wyatt Earp. The quaint structure is just crying out for a bride and groom to softly murmur “I do”—which should give you a hint of the ideal use for this property. Although it’s currently a private residence, listing agent Amy Ali of Compass believes the Beach house would be perfect as a bed-and-breakfast or a venue for events such as weddings, teas, or philanthropic activities. Located close to a Catholic university, it could easily serve as a chancellor’s residence, Ali adds. Ali also notes the virtues of its lavish indoor features. 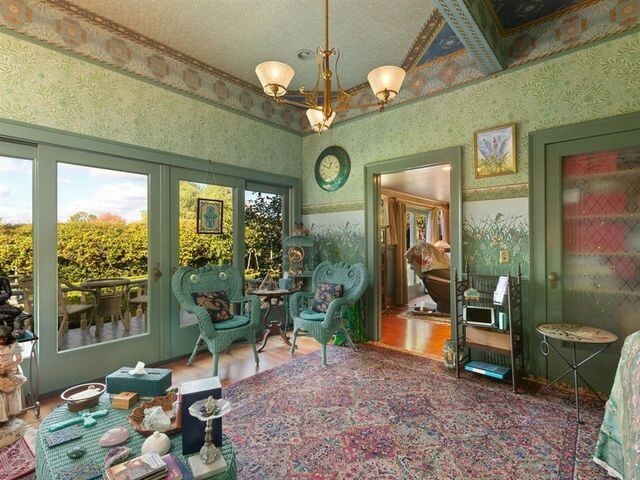 Foremost among them is elaborate wallpaper extending to the ceiling. 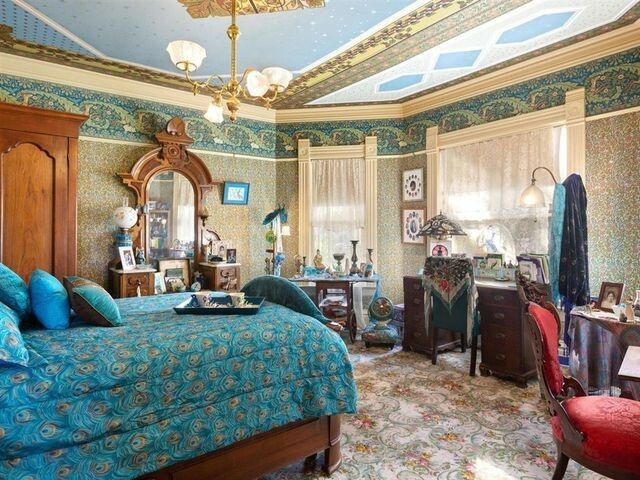 The hand-printed Bradbury & Bradbury wallpaper—custom-designed for this home—took over six months to apply and cost hundreds of thousands of dollars. 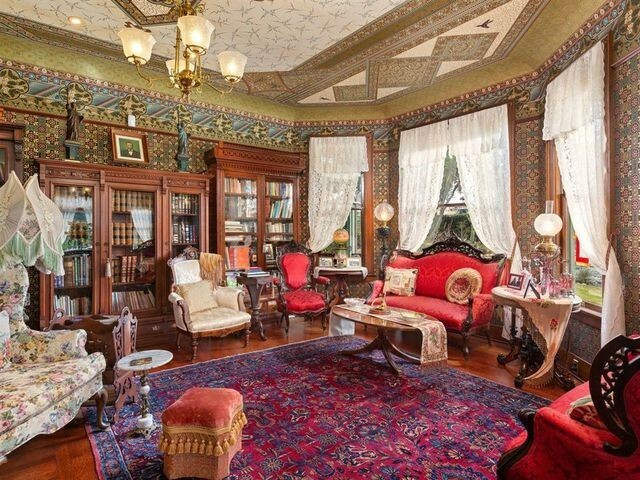 A previous owner spent millions of dollars and decades of his time restoring the estate to its original glory. 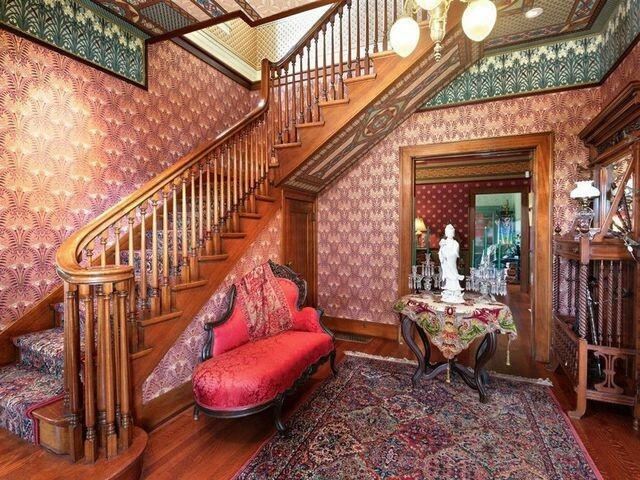 Many of the home’s original features were renovated and restored, including the gas lamps that were converted to electricity. Craftsmen spent months working on the home. 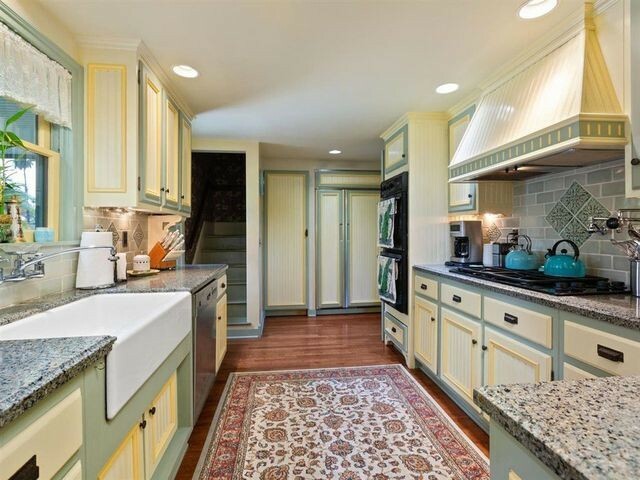 The 3,300-square-foot home has four bedrooms and 2.5 baths. 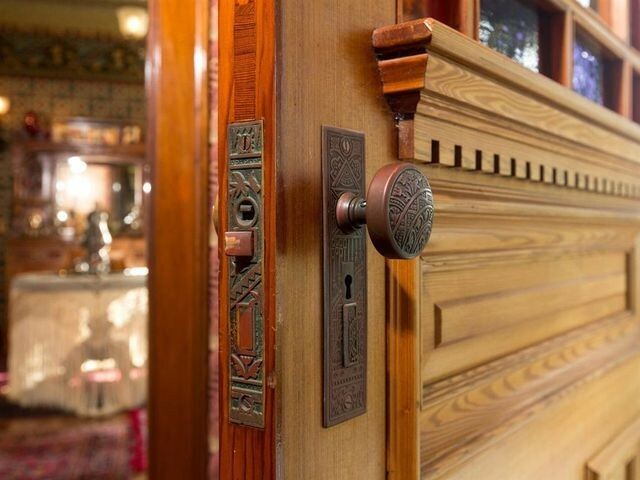 Every inch of this home has the mark of a craftsman—there are custom-made, hand-crafted wood doors, antique fixtures, and stained- and leaded-glass windows done to period perfection. There are also expertly restored pieces of furniture that have been in the home since it was built, including sofas upholstered in red silk and custom-built bedroom sets. The price of the furniture is negotiable along with the purchase price for the home. The home’s infrastructure, kitchen, and bathrooms have been seamlessly updated so they blend right in. The detached garage, now used for covered parking, a gym, and a “Martha Stewart–worthy laundry room,” according to Ali, is topped by solar panels that power the house. Note the solar panels on the garage. 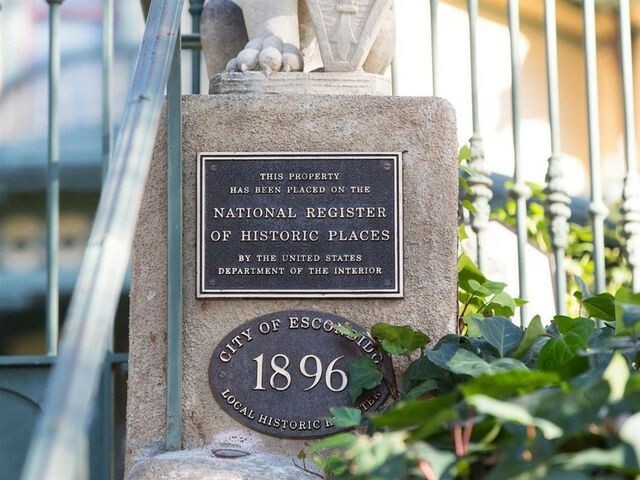 The estate is on the National Register of Historic Places and is part of the Mills Act. 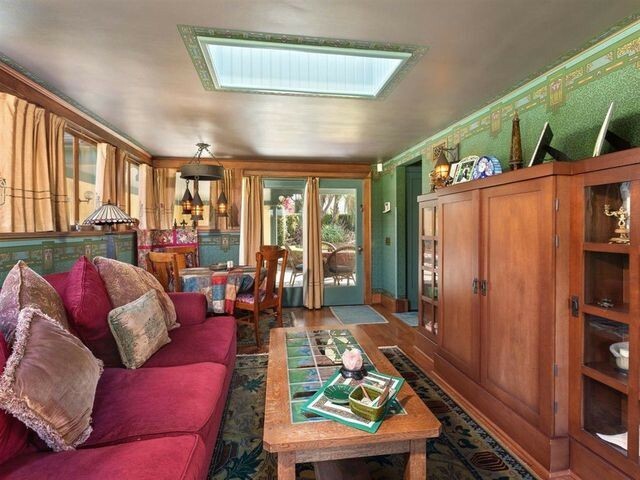 It’s also been featured in San Diego Home and the San Diego Union-Tribune. The home’s located within walking distance of downtown Escondido’s Grand Avenue, so residents can stroll to numerous fine restaurants, the Mingei Museum, and the nearby California Center for the Performing Arts. The home itself is “like a museum inside,” says Ali. “The photos don’t do it justice. 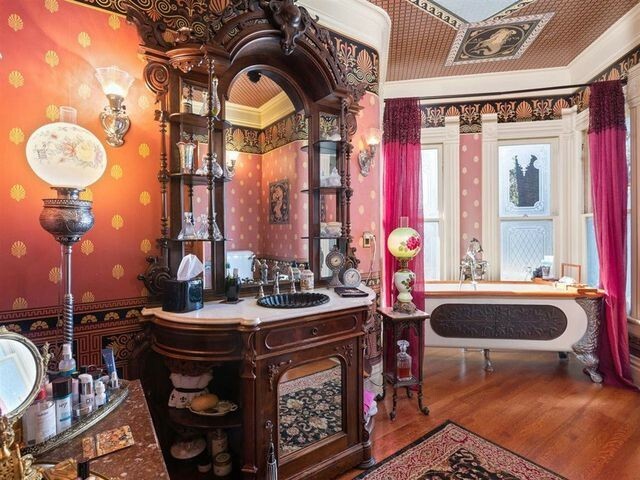 No expense was spared in the restoration.” She asserts that anyone who appreciates Victorian style would be right at home in this historic treasure. 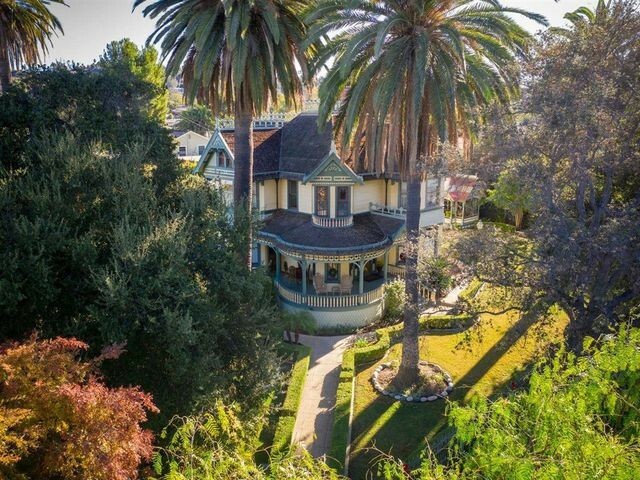 The Victorian home sits atop a lush knoll.